If you have no PADI Scuba Diving certification yet and are looking to make scuba Diving your career then this PADI Internship is for you. In this PADI Divemaster Internship program we start with the Open Water Diver course, then you will move onto Advanced Open Water and Rescue Diver training and an Emergency First Response (EFR) course will be included as well. Once these courses are completed then it’s onto the first professional level: The PADI Divemaster program. This Go Pro scuba class is an intensive 6 week long diving internship. This will ready you for work as a Divemaster, the program includes 60 dives necessary to gain your certification. Upon completion of this program it is possible for you to find employment in the dive Industry. Divemasters work alongside PADI Instructors to ensure that PADI courses are safe, fun and run smoothly. Divemasters play a pivotal role in the success of dive operations around the world. Whether you are looking to change your career, taking a break from the rat race or if you are simply looking for 6 weeks of diving and fun in the Cayman Islands, we have the PADI Internship for you. Reach high and aim big, join our PADI Divemaster Tribe and break into the diving industry and make something you love your job, you won’t regret it, we guarantee. 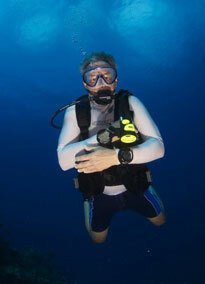 All PADI Training manuals and materials. Have a PADI Medical ( PADI medical form) signed by a physician within 12 months. If you do not have your own Scuba diving equipment Don't Worry, you can rent a full a BCD and Regulator from us for only $500US. Be sure to check out our equipment rental page for more details.